We like Yankee Candle here at V&L and we find that a lot of their scents are comforting, they evoke memories and create new ones and just make you feel good. Their harmonious blend of ingredients stir up the senses and can create a romantic atmosphere perfect for Valentine’s Day. Top Notes… Remember the very first time you met the love of your life? The initial rush of excitement and first impressions are exactly the same as a Top Note. Typically citrus, fresh, light, sparkling and clean the ‘Top Notes’ create the first point of a fragrance experience. This fragrance, like any good memory is likely to stay with you reminding you of exactly how you felt at the time. Middle Notes… There is nothing better than getting to know someone and the more you find out, the more you like. Often described as ‘the heart’, Middle Notes are made up of spicy, floral and woody fragrances, giving body to the candle scent as well as freshness and a sense of stability. Just like a relationship, Middle Notes evolve over time becoming even more lovable. Base Notes… Familiarity creates a strong bond between you and your partner. Base Notes are long lasting, strong and tenacious, just like a couple who know each other inside out. Base Notes are often made up of spices, vanilla and musk, creating a foundation defining the fragrance with the scent gradually becoming stronger as it burns. So lets make this Valentine’s Day special and create memories that will last forever. 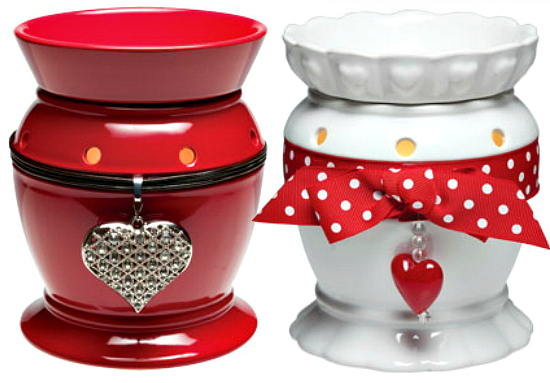 So it’s no secret that we love Scentsy here (we love a lot of things actually) so we thought we’d start our Valentine’s festivities off with some lovely gift ideas from Scentsy for a loved one for Valentine’s Day or even just for yourself to make you feel of happy and gooey on the inside. Awwwh! Scentsy also have a whole heap of lovely scents that are sure to fill the air with romance and get you in the mood for love. Garden of Love – A secret garden of night-blooming magnolia and earthy musk interwoven with mossy green grass. Lucky in Love – Sweet bouquet of mandarin, bergamot, and orange with hints of peaches and berries. Love Story – Innocent pink jasmine and sensual amber embraced by luscious dark chocolate. Simply Irresistible – Lavender with a strong, woody background of amber, moss, and musk. Happy Go Lucky – This captures the exhilaration of a new romance with luscious red berries, silky orchid, and Japanese plum floating on a cloud of amber vanilla. Oooh they’re all so amazing! Colonial Candle the amazing candle gods that they are have introduced their exclusive Colonial Cocktails Collection. Strawberry Daiquiri: Lounge poolside with a refreshing blend of fresh crushed strawberries and lemon zest with a thin layer of creamy vanilla. Piña Colada: Relax in your favorite sunny spot with a delightful blend of sweet pineapple juice, Malibu rum and coconut cream. Amber Ale: Grab a brew in a local pub with this intriguing combination of malt liquor and hops with a hint of wood and chocolate. Gin & Tonic: An iconic cocktail highlighted by sparkling and effervescent citrus notes of neroli and lemon garnished with a slice of lime. Manhattan: Cheers with old friends to the scent of musk, patchouli and oak wrapped in the warmth of vanilla and a hint of intoxicating bourbon. Mint Julep: A Kentucky favorite with notes of bourbon, sweet cane sugar and refreshing mint leaves. Sweet Tea Vodka: A sweet Southern classic of fresh brewed tea, brown sugar and vanilla vodka topped with iced orange blossom. Yes please to all of them right?! Wanna know something else totally amazing about these candles? Each of them features a removable label with a cocktail recipe inspired by the fragrance. I’ve never been in a B&M store before, we have had one in our town for over a year but I’d never gone in. I don’t know why I just never had. I was looking for one of those family organisers and couldn’t find one and thought I’d see if they had one. They didn’t but I started to have a mooch about as I was amazed how much stuff they had in, from linens to food, to toothpaste to candles. I saw these and thought they were really cute and then I saw the price. 99p each! So yes I bought two. I have tried out both and they both do their job perfectly. The candle base doesn’t have marks for where the candle should sit but it’s pretty obvious isn’t it really? Also I had to pick my way through the ones in store as some were quite marked but really happy with these two purchases. Adds a bit of fun to my collection. I’d be tempted to buy another in a different pattern/style too and at 99p they are one of my best bargains I’ve found. Even Sam was surprised and she doesn’t get surprised much! Oh how we do very much love Colonial Candle; ever since we were lucky to get to try some treats from The Collection we’re just a bit obsessed. You know how you get excited when a new season of your favourite TV show is about to start or when your favourite designer launches some new shoes or whatever, well that’s what we’re like when we find out that our favourite candle folks are launching new scents and treats. It’s gets all very loud and “OMG” here at V&L. Colonial Candle have six bright and cheerful new fragrances that will add a little sunshine to your everyday. Brazilian Lychee – An exotic combination of juicy rambutan, wild passion fruit and lychee. Lemongrass & Cilantro – A refreshing scent of lemon, mixed with armoise and sparkling bergamot. Daffodils & Daisies – A bright and cheerful blend of airy greens, citrus and blooming jasmine. Leeward Lagoon – A serene and tropical mixture of water lily, flowering tonka and pink grapefruit with a splash of coconut water. Water Lily – A simple delight of dew-covered greens, fresh jasmine and soft cedar. Oh how we need them all!